NEWBORN MINI "ALL WRAPPED UP"
What is this Cake Smash and how to prepare for an AMAZING One! 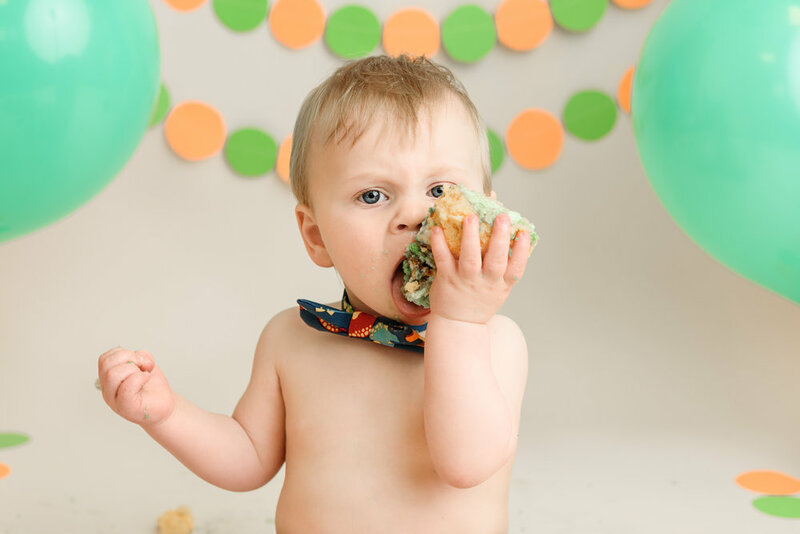 When I mention Cake Smash for my newborn clients in the studio, not always they know what am I talking about. 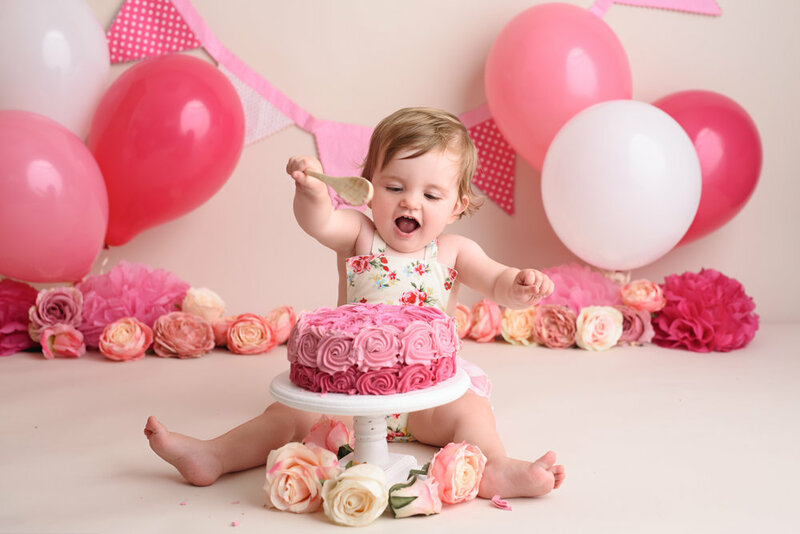 So here it is the complete Guide of What is a Cake Smash and How to prepare for the best one! CAKE Smash is pretty much in the words… it is a cake being smashed by your one year old. It is really great fun experience for everyone and a milestone that is captured in a most unique way! I decorate the set up for the Cake smash according to your colour choices and preferences, themes and characters. It always start with Birthday portrait, then Cake Smash and we end it with the splash in the tub. You are always welcome to bring outfits to the cake smash, but I always have an outfit ready too, to go with your chosen theme. To smash the actual cake is great fun! but those who are not biggest fan of cake, can bring other foods! We could do watermelon, spaghetti, fruit, pizza, tacos...anything you know will be fun for your baby! I have the parents to provide the food, and of course everything is agreed prior to the shoot so all the details go together nicely! Now about the food… Is it necessary? yes! If you don’t believe me, try to put your one year old in the middle of the room and start the clock on how long they will last without getting upset, moving, and overall getting super annoyed, wanting mummy. Food gives child an adventure. It is something that they can play and get messy and also tastes amazing (by this age you know that everything that baby touches goes to their mouth as well!) They enjoy squeezing, building, bashing with the wooden spoon (one of my props) splashing, throwing.. the game is endless. AND SO MUCH FUN!!! The answer is PREPARATION! If prepared for the occasion, babies will recognise and play. Because Babies loves playing! And yes, babies around this age sometimes experience stronger separation and stranger anxiety. In order to bring babies fun out I always let kids warm up and have toys and songs for them in case they need them. few minutes and they are more curious of their surroundings then they are sad. HOW TO PREPARE FOR THE AWESOME FUN CAKE SMASH? 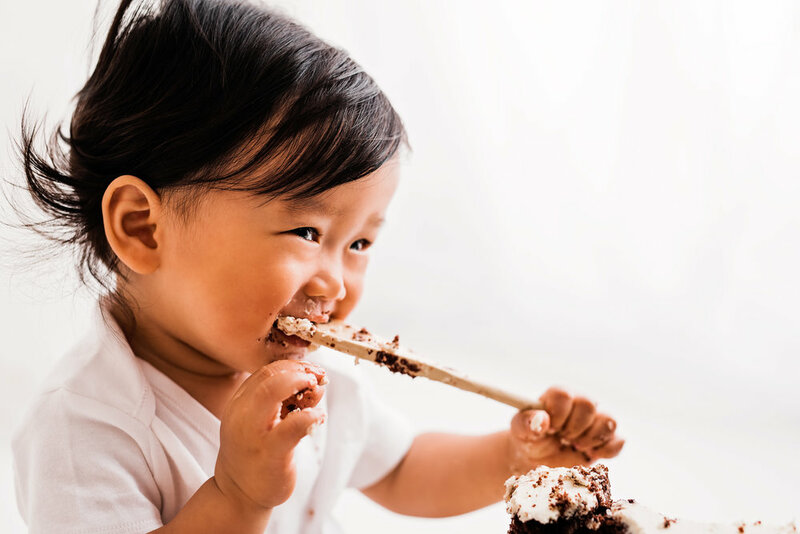 To prepare baby, let them play in mashed potatoes or some kind of mushy food before the cake as often as you can. Also give baby cake or a cupcake (WITH BUTTERCREAM ICING) a couple times, a week and few days before the cake smash. The sugary icing is a shock and often parents will be disappointed when baby isn't interested at all because they've never had it before. There is a much better chance of a successful smash if your baby has touched it and tasted it before! BRING SNACKS! 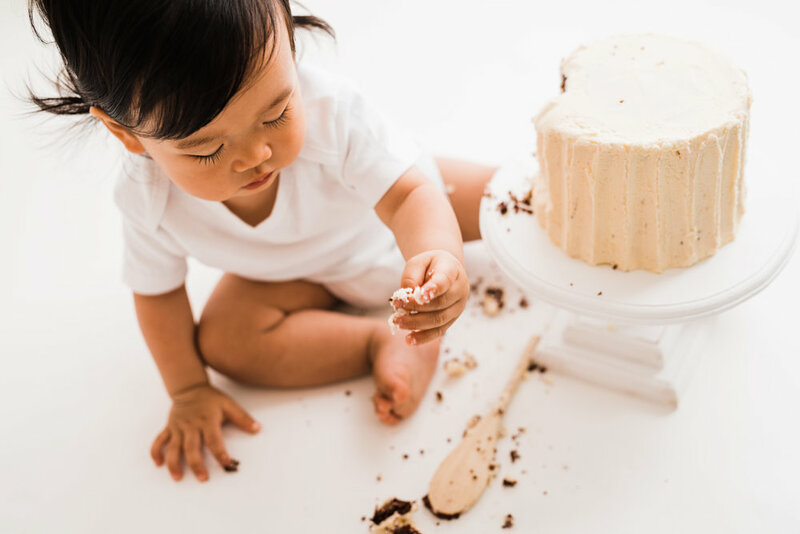 - some of your babies favourite snacks (the ones that they reach out and put their hand out to get it) and if they aren't digging into the cake, we will put some of those in the back and then they will have another game of it! Please Bring a towel for after splash in the tub. bigger towel is great to swaddle and dry them quicker. Those two are main reasons, but you it can be more. You should let me know at least 48h prior the session in order not to loose your deposit. Usually we can reschedule in a few days time and have a fab session once baby is feeling great, with loads of smiles involved! 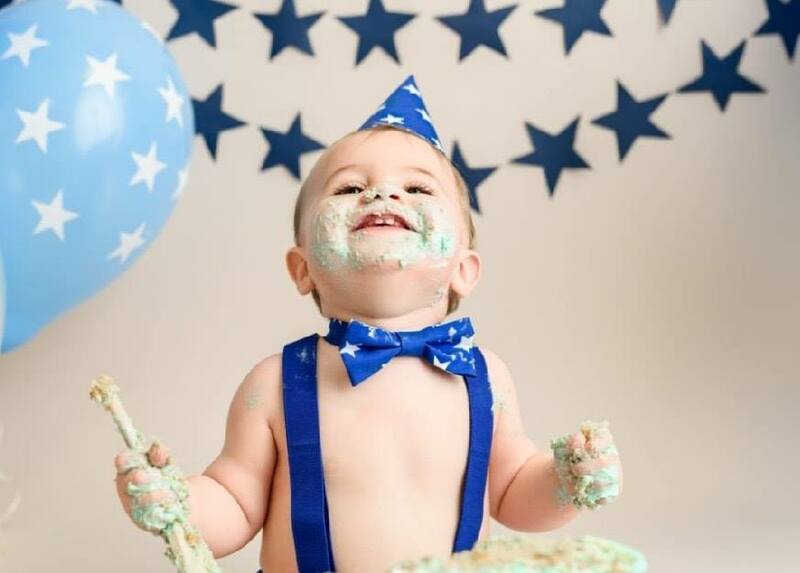 I hope you enjoyed reading my blog and feel that now you can prepare for your babies Amazing Cake Smash. Here in our studio we enjoy cake smashes a lot and would love to celebrate with you. 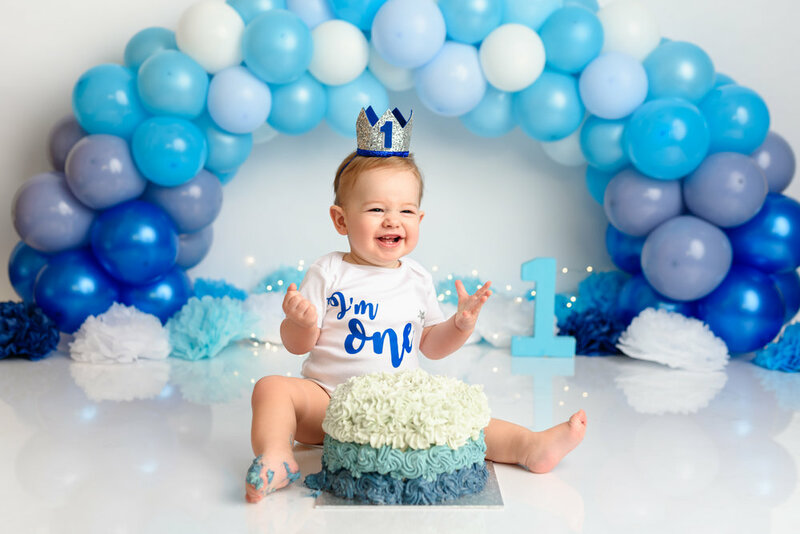 We usually get Cake smashes booked and planned in advance, so send us a message now and enquire about our diary availability for your babies special occasion! Any questions? Happy to answer! All my love and for the love of Cake Smashes! Gift Guide For New Or Expecting Mums This Holiday Season! When holiday shopping for an expecting friend or partner, it can be tough to find that perfect gift! With all the bibs, bottles and cute outfits she is likely to receive, finding something that stands out is important! In our latest blog post, we will look at some unique and thoughtful gift ideas for your favourite mom-to-be! 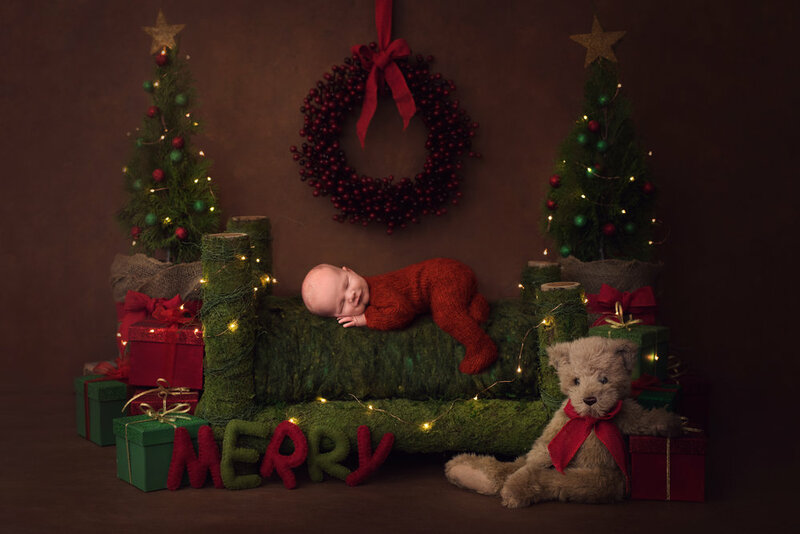 Bespoke Newborn sessions are indeed a perfect gift this festive season. 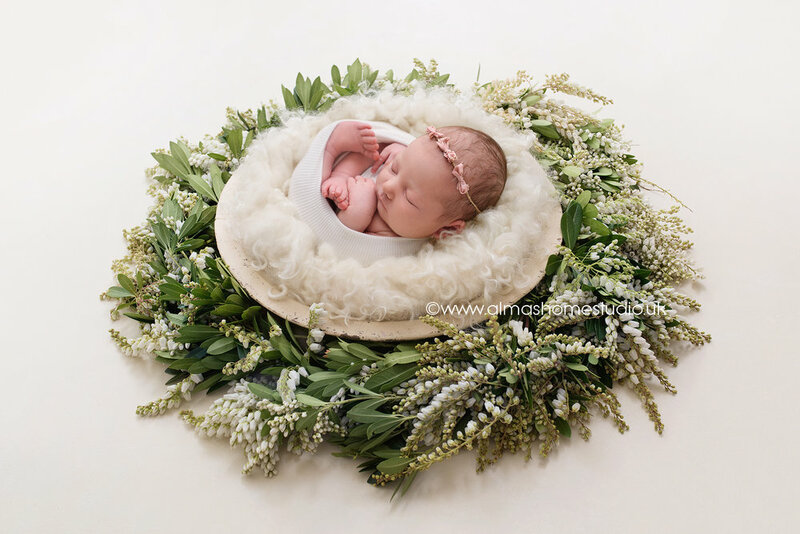 Professional photos are something any new mom will want and appreciate. 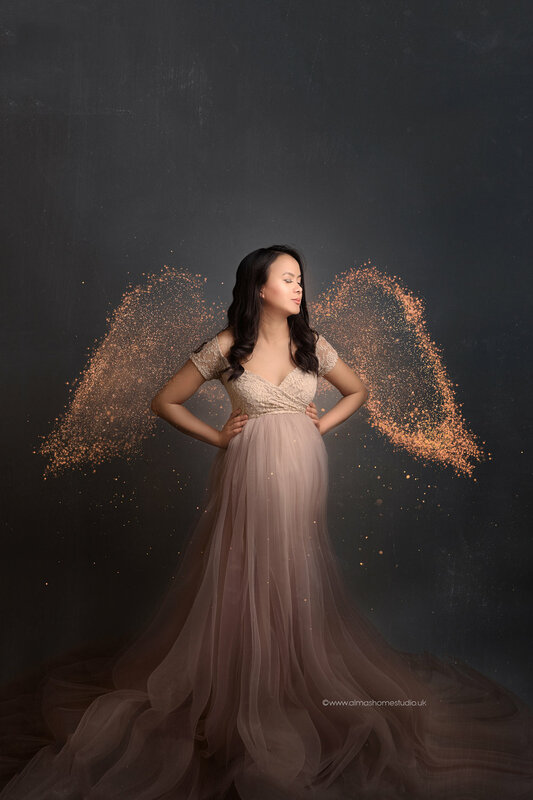 Whether they be maternity photos, first baby photos or photos of the family all together, giving a gift certificate for professional photographs is always a great idea. It’s one of those things everyone wants, but may not always purchase for themselves. Many people will focus on the necessities and not on the special mementos that will mean so much in the years to come. Here at Alma’s Home Studio, we offer gift vouchers for all types of sessions! Whether you decide to give that special someone the gift of professional photos or not, an album and/or a picture frame will always be well received. New moms may want to choose their own baby books, however a photo album will always be a cherished gift. 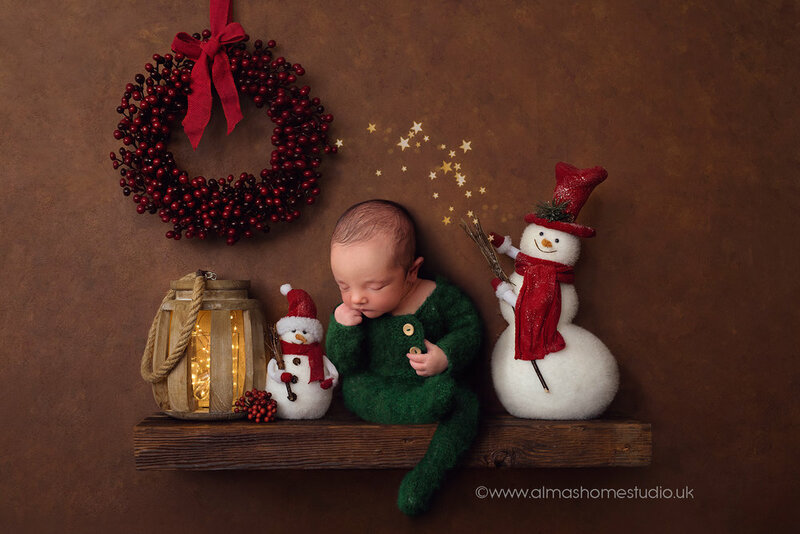 Combine these items with a gift certificate to the best newborn photographer in Dorset, and you are sure to make the recipient very happy. It’s not uncommon for new parents to have a “Baby’s First Christmas” ornament for their tree. Giving something to commemorate the little one during the holiday season is a wonderful sentiment. The new parents will always remember who gave it to them, and will love to unpack it with the other ornaments year after year. Choose something meaningful and personalised if possible. Handprints, Footprints and Even Belly Prints! There are all kinds of kits available to help the new parents create hand and foot prints of their little one. There are many plaster kits on the market, many of which include a picture frame. There are other “no-mess” ink kits that can be used in a number of ways. The prints can be copied for friends and relatives too! You can even find plaster kits for the mother-to-be’s belly! The plaster will cover much of the torso and will be a wonderful keepsake to look back on. pregnancy is when mothers should be spoiled the most! Think of all the work, pain, discomfort and sleepless nights they endure during these nine months (and also for the next 18 years!) A wonderful gift idea is to offer some pampering for the new mom. You can choose to give them a prenatal massage, or maybe a spa day where they get their hair and nails done. These kinds of things are often skipped over by pregnant women as they are more focused on the little one. Of course a mom-to-be will want some of the comforts of home with her, but having a pre-packed maternity bag with everything she might need will be a huge help. The bag can include the necessities such as a tooth brush, lip balm, headphones, and other toiletries. You can also step it up a bit by adding fancy lotions, a kindle or something to read, slippers, a robe and some comfy clothes. This will help mama avoid the stress of having to pack her bag for her hospital stay. People love receiving personalised gifts for their newborn. You can have almost anything personalised from receiving blankets to story books, from picture frames to teddy bears. You can choose to have the baby’s name added to something or opt to provide a gift certificate so the new parents can customise the item once the baby arrives. Best gift for Christmas is the gift of memory. If you are planning a baby shower during the holidays, there are a number of things you can do to make it festive! While there is no shortage of decorations available, you might want to differentiate the shower from a Christmas party. You could choose to do a white theme, making the space look like a winter wonderland. Or you could opt to make it feel warm and cozy by having the guests come in their best flannel pyjamas. You could offer a pie and hot coco bar, with different flavours and varieties available. For games, you might have a gingerbread house making contest or a “fill in the blank” Christmas carol game. You could even have classic Christmas movies playing in the background, both to set the mood, and to let mama know what’s to come in the next few years! No matter what you choose to get for the new mom or mom-to-be in your life, take the time to choose something thoughtful and from the heart. If you are looking for a newborn photographer in Dorset, or if we can help you in any other way, please don’t be afraid to reach out! It is indeed a long journey.. 9 month growing another human (or humans) in your womb. For some it is a surprise, for some it is a planned pregnancy, for some it is a rainbow, and for some it is a true miracle. So if you are looking for a newborn photographer near Poole, or Bournemouth or Wimborne or even Salisbury and Weymouth. I am based in Blandford Forum and as one of my customers said "well worth the trip" :) I would love to hear from you and will be forever grateful if you would share this blog with someone you know would benefit too. I hope you enjoyed reading my blog and I hope it was a useful read and helped you to find me. First let me share my excitement! 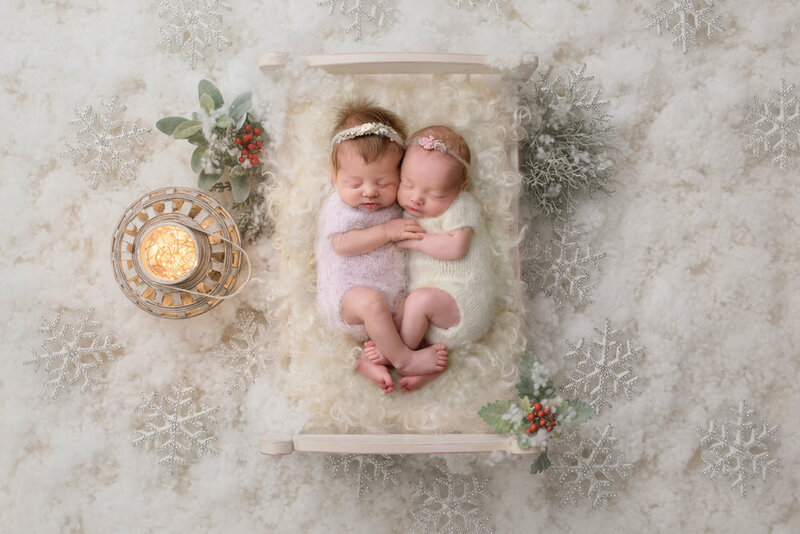 I had newborn twins in my studio, little Nathaniel and Elodie. Beautiful babies and loads of cuddles.. I felt really organised and prepared for the session. I had a posing flow, several sets ready and assistant Lucy (who is my sister in law, but really good with babies, true whisperer) I have Instructed Lucy what the plan was and we waited for twins to arrive. The session was really hard and the twins were taking turns to sleep, and most of the planned sets didn’t happen. But this happens a lot, as sometimes I just go with the flow and make sure baby is happy. Therefore I offered a location shoot for part 2 to make sure I have outstanding images for the family. All poses are completely safe and where required, baby always supported. This pose, where it looks like baby is holding her chin on her hands is a composite and baby was never alone or unsupported. It is really important to understand that photos I produce comes from experience and post processing magic and should never be attempted without special training and skills. Hello and welcome to my first blog. I have never done this before, so be kind. I am so blessed to be able to document the first days of a new baby, all the squishines and pouts and tiny feet and tiny hands.. 3 hours usually flies by and than the other part of newborn photography starts - retouching. Editing is a huge part of the process and newborn skin is what I can spend hours on.. why do I edit newborn skin..? When I gave birth to my little girl, I remember her eyes, tiny nose and lips so pink.. she was and still is just perfect to me! why don’t I remember her eye being so red, bit bruised from birth, I don’t remember the massive bruise on her forehead too.. because I love her so much I never noticed any of that and in my head I have a perfect picture of my baby girl.. and If I would ask any mother, she would tell me exactly the same - my baby is perfect. So when a baby comes to my studio, I don’t see the bruises, the jaundice, milk spots, super dry skin, redness, discolouration, rashes etc.. what I see is cute facial expressions, cute pout and tiny fingers, most amazing hair, eyes and I could carryon forever! I see the beauty and I capture perfection. And that is why I edit newborn skin, I want everyone to see exactly how new mums see their new baby - complete, absolute perfection.